The traditional barber shop… When we opened our shop in early 2008, we did it with the goal of creating a barber shop that embraces tradition, but with a current feel. With over three decades of combined experience, our barbers have a sincere appreciation for the time-honored gentleman’s barber shop and its traditions. We believe each time you get a hair cut it should be something to look forward to. That is why we focus on creating the same experience we had when our fathers took us to the barber shop: a comfortable, laid back atmosphere with friendly service and familiar faces. 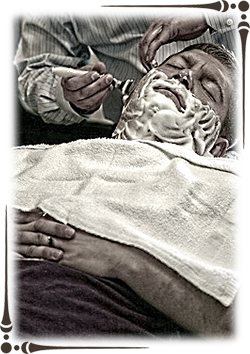 We want to provide every client something to look forward to, whether it’s a classic hot towel shave, a hair cut, or a simple beard trim. You will leave looking better and feeling better about yourself. That is something we believe is important with every visit.